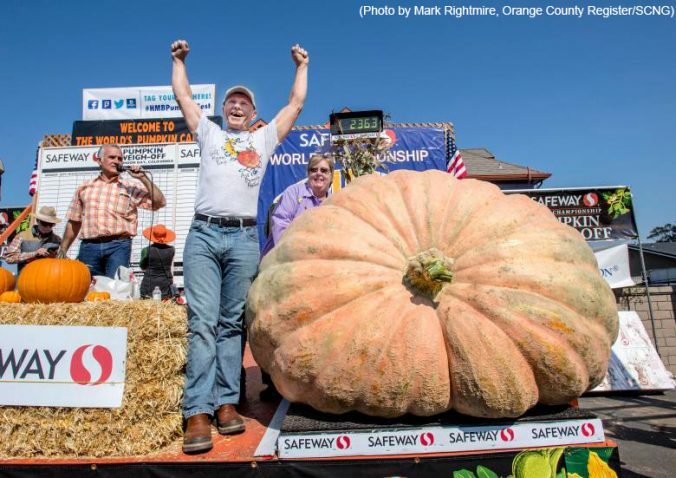 On the morning of October 9th, 2017 Joel Holland of Sumner, Washington took the first-place prize in the 44th World Championship Pumpkin Weigh-Off in Half Moon Bay, California. For close to three hours, the crowd watched as pumpkin after pumpkin was lifted by forklift and placed on the scale. They watched with anticipation, waiting for the heaviest pumpkin to reveal itself. When the last pumpkin of the day, Holland’s giant fruit, was placed on the scale anticipation filled the crowd. When the numbers flashed on the screen the crowd boomed. The 2,363-pound pumpkin is the heaviest pumpkin ever in the history of the World Championship Pumpkin Weigh-Off. Holland and his wife Mari Lou arrived at the competition with his giant pumpkin on the back of his pick-up truck. This record breaking pumpkin gave Holland his 7th win at the pumpkin weigh-off. He walked away with $7 per pound prize money, that’s $16,541 in pumpkin winnings. Runner-up Cindy Tobek, of Olympia, Washington, came in 361 pounds short with her 2,002-pound pumpkin. But she was still beaming with pride, as she beat her 2016 winning pumpkin that weighed in at 1,910 pounds.